180 checker play problems taken championship tournaments. Each problem includes a diagram, Gnu BG rollouts of the top plays, and a brief description of the tournament the problem came from. "Each problem comes from a recent championship event involving two world-class opponents. In more than 60 instances, the play made at the table was an error or worse as evaluated by Gnu BG. The format allows the reader to first solve the problem on his own and then compare his move with the best play and also with the play actually made. The father-and-son coauthors have created a worthwhile additional to any serious player's backgammon library. I thoroughly enjoyed this take-to-the-beach book. "Robert Stoller (Director, Anchorage Backgammon Club), Letter, Flint Area BackgammoNews, Spring 2013. COVER: Rolling doublets is one of the most thrilling aspects of backgammon. 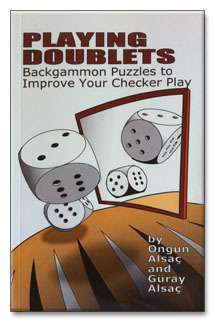 This book, aimed at advanced binggers and intermediate players, makes game-strengthening puzzles fun by focusing on doublet positions, containing 180 of them drawn from championship tournaments. Pit yourself against the giants of the game and sharpen your tactical vision! 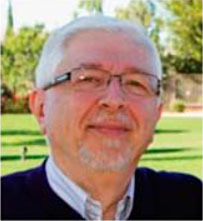 AUTHORS: Ongun Alsaç is a retired electrical engineer living in Chandler, Arizona with his wife Serap. 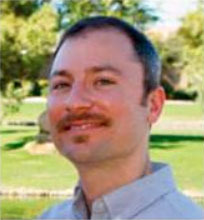 Güray Alsaç is a software engineer living in Sunnyvale, California.